When it comes to e-commerce, the hotel industry is a unique one. The goal, of course, is bookings, and a hotel can get them primarily in two ways: 1) through their own website, or 2) through an online travel agent (OTA) like Expedia or Booking.com. But OTAs charge up to 30% commission, which can leave hotels in a very vulnerable position. Because of the OTAs’ size and power, hotels are forced to pay the commissions (eating into their own profits), or risk being demoted on the OTA site. 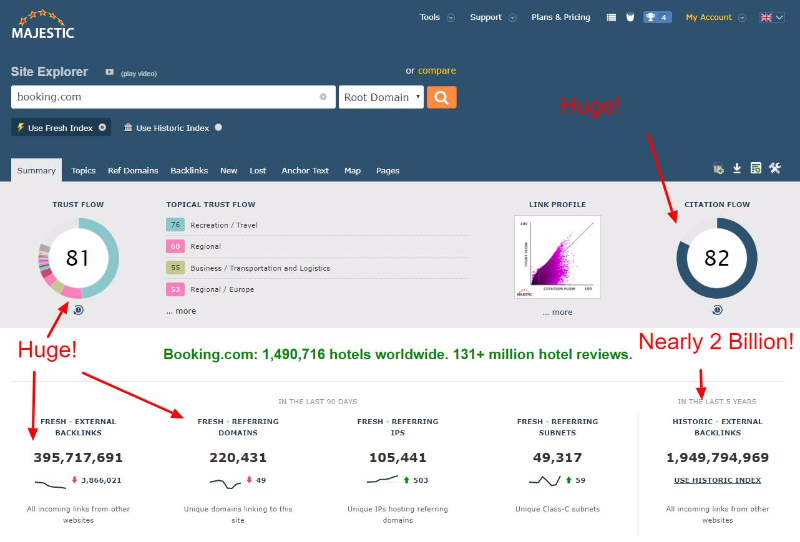 The backlink profile of Booking.com taken from Majestic.com– illustrating what most independent hotels are trying to compete against. The only way to really fight back against the hefty commissions is to drive as many bookings directly to the hotel website as possible. And that requires a smart e-commerce strategy that includes both paid and inbound marketing. At Travel Tripper, we help hotels maximize this strategy, supported by online tools like Majestic. Here are 7 ways that Majestic is helping us help hotels win the direct bookings battle. When we take onboard a new client for our SEO services, one of the first checks we carry out is a backlink audit of their domain name. During the auditing process we will record the number of total backlinks pointing to their site, the number of referring domains (and subsequent backlink/domain ratio), the diversity of anchor texts, the types of links (text, image) plus whether they’re nofollow or not, the timings of the links, the destination of the links (to which pages are the links pointing), and of course the quality of the links (which is mainly determined by the TrustFlow metric within Majestic). Not only is this an important part in the onboarding client process, but it also provides us with a benchmark to work with going forward. We advise hotels on how to acquire backlinks and so we need a tool which allows us to measure their progress – and generally speaking, the number and quality of links obtained should determine how well they’re going to perform organically. 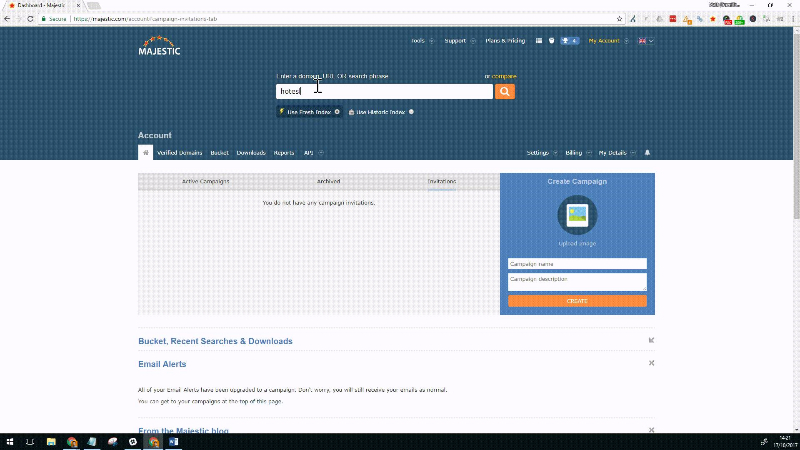 A screenshot showing the Anchor Text analysis of TripAdvisor.com within Majestic.com. It’s not often that you see a sudden, sharp drop in organic search traffic without having changed anything on your website. Usually, it means one of two things; a major Google search algorithm update has recently rolled out, and your site was penalised for whatever reason, or that you’ve picked up a number of nasty backlinks (which ultimately again results in a Google penalty). Due to the very active threat of negative SEO, and the “real time” nature of Google Panda, it’s really important to keep an eye on the quality of your incoming links. For that reason, we like to regularly carry out toxic link audits on our clients’ sites just to keep on top of things. To carry out the audit we simply need to use the Site Explorer tool to analyze the Root Domain, before exporting the backlink data to a spreadsheet for further review. Within the spreadsheet, we can filter to only show backlinks with a TrustFlow of less than 10 for example, in order to speed up the process. If it wasn’t for this handy metric provided by Majestic, we’d have a real problem going through all our client’s backlinks – especially when you consider some of their domains have tens of thousands of links. 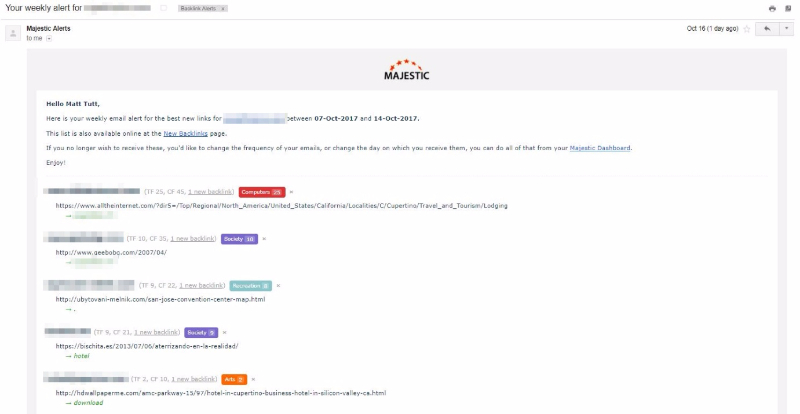 Carrying out the toxic link audit in Majestic is simple; enter the URL, run the scan, and then export all Backlinks before filtering by the Trust Flow metric. If you find any very dubious links, after reviewing them individually (visiting the site – but only if you have good anti-virus/firewall software installed!) 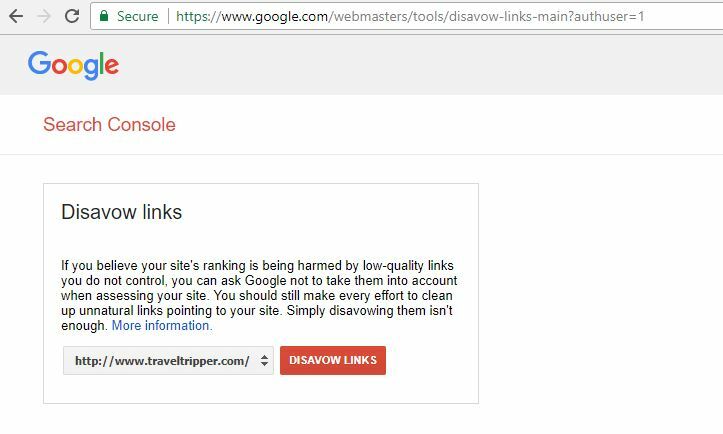 then the next step would be to disavow within Google Search Console for all variants of your domain. And if that investigation comes up blank then you’ll need to do your own on-site analysis to see if there’s another reason behind your organic drop – start by pinpointing where the drop occurred, and for which keywords. If that leads nowhere then double-check your tracking software is correct. One of my favourite ways to get to grips on a hotel’s organic search competitors is by running the Clique Hunter tool within Majestic. This enables me to enter up to 10 websites and analyse all their backlinks in bulk, with the resulting scan showing me a list of websites which link to any of the previous competitors. The idea here is simple – if website Z is linking to my rival hotels A, B and C, then logic dictates that website Z could be a relevant site to target for a link. Obviously, it’s not going to ensure you get a backlink, but it does eliminate a bulk of research on your behalf. The Clique Hunter tool doesn’t have to be used to analyse your rivals either. We like to take in a handful of businesses located in the same area as our client’s hotel (businesses which tend to rank quite well in local search too) and then run the tool. This can come up with some great local sites to target for backlinks too, for that all important local SEO boost – critical for hotels. 4. Staying on top of the landscape with Backlink Monitoring we mentioned earlier that the toxic link analysis was essential for checking on any bad links that might be dragging a client’s site down in the rankings, well with Majestic’s Backlink Monitoring tool we can keep on top of that even better. Just by entering their domain into the tracker, you will be set to receive weekly updates on the backlinks won – and lost. That can enable you to take decisive action before the full impact of the bad link is felt, which is immensely valuable. Not only do we use the tracker for that but we also like to keep on top of any new links picked up. As we’re often giving clients suggestions on where to pick up valuable links, we like to see if they make progress or not. As a side, we don’t carry out the backlink acquisition requests ourselves, as we feel it’s more transparent (and successful!) when it comes directly from the hotel. As you can imagine, this is also a useful way to keep on top of any other competitor’s hotels, to get ideas on where else they can gain some powerful backlinks. Sometimes when we work with a new hotel and are designing them a new website, we may find that although they’ve provided us with their website address (hotelname.com), they neglect to mention that they once had their blog located on a subdomain, or they had some other functionality setup on a subdomain of their site. To avoid “overlooking” this previous online real-estate, we use Majestic to analyse backlinks to the root domain but then switch to the Historic Index and export our data. This will show us all previous backlink history on the domain, and by applying some filters to the spreadsheet we can then check to see which (if any) subdomains existed. Then it’s a simple case of 301 redirecting these subdomains to the most relevant place prior to launching their new website. This ensures we retain any authority these subdomains have built up – and if they have backlinks pointing to them then they likely do have at least some level of search authority. Sometimes a hotel will close, rebrand itself and then re-open. This might be done relatively quickly, or many years may elapse in between. Many times, the hotel name changes, as does their website address. When the new hotel opens, and their new website launches, to ensure they’re not starting from scratch with their organic performance we like to give them a big helping hand by utilising Majestic and scanning their previous domain. Not only does this show us the huge list of sites that were linking to the old hotel’s website (which we will definitely 301 redirect to the new site), but this also gives us information to share with the hotel – each of these links to the old address, and references of the old hotel name, would ideally get updated to point to the new URL and reference the hotel’s new name. This makes sense SEO-wise because the link is now direct (it saves the redirect later) and there should be less confusion surrounding the old name. It’s really important to keep NAPs consistent (name, address and phone), so to avoid any confusion from the search engine’s perspective (and any web visitor) it all makes sense to update the name used in the anchor text. Although not essential, when a site moves from non-secure (HTTP) to secure SSL (HTTPS), it’s a good idea to get any backlinks updated to reflect the hotel’s new SSL status. It’s likely that you will have 301 redirects setup already, but as noted in the previous point there’s more SEO benefit when the link is direct – it has no redirects that need to be crawled and understood by search engines, and no link authority is lost in the process. When some sites make the switch over to SSL it can cause some messy redirects, which can lead to lengthy redirect chains or redirect loops, neither of which are going to be doing your SEO efforts any favours. That’s why, wherever possible, the original source of the link should be updated. Glad you are using Majestic to the full! I have one more suggestion… you can type "Hotel Cityname" into the home page instead of a URL. This defaults to the Beta "Search Explorer" which lists sites or pages we think are influential for that phrase. These make good link candidates in their own right, but also provide another complimentary list for the Clique Hunter tool. That’s really useful to know – thanks a lot, Dixon! Appreciate all the hard work and effort that goes into Majestic too.